Low and slow cooking in the oven results in moist, tender ribs that rival the best meat cooked by top grill masters. It’s a no-muss, no-fuss method requiring very little prep time. 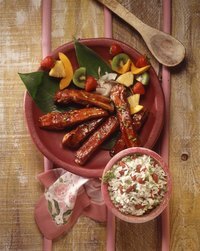 Seasoning can be a simple matter of pouring on bottled barbecue sauce or creating your own. It takes about two hours to cook 4 pounds of country-style or baby back ribs. If you’re having company, plan on three or four ribs per guest. Remove the ribs from the packaging. Pour barbecue sauce over the ribs, flip them and coat the other side with barbecue sauce. Line the roasting pan with aluminum foil and place the ribs on the rack in the pan, meaty side up, and cover, either with a tight-fitting lid or with aluminum foil. Put the roasting pan on the center rack of the preheated oven and cook for two hours. Every half hour, baste the ribs with the sauce that has collected on the bottom of the pan. After 1 hour, flip the rack of ribs and continue cooking. Slice the ribs into individual serving sizes of two or three ribs each. Make your own barbecue sauce by simmering together chopped garlic and onion, a sweet ingredient like molasses or brown sugar, a tomato-based product like catsup or tomato puree, and seasonings. Add heat with chipotle, horseradish or cayenne. For an Asian sauce, add ginger and soy sauce, star anise, Chinese five-spice powder or wasabi for heat. Substitute a dry rub for sauce. Combine sweet ingredients like granulated or brown sugar with savory ingredients like cayenne pepper, salt, dried herbs and black pepper. Rub the mixture over the surface of the meat before placing it in the oven. Take off any silver skin -- the tough, inedible connective tissue on the bone side of the rack of ribs -- by slipping a sharp paring knife under one end of the silver skin and sliding it along the underside, taking care not to remove edible meat. A large rack of ribs may take longer than two hours to cook. To decrease cooking time, cut the rack in half and cook in two pans.